Assessment of multimedia composing is a very young discipline. 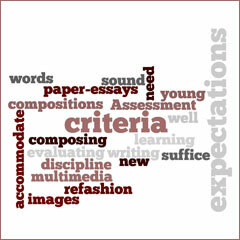 Will our learning expectations and criteria for composing and evaluating paper essays suffice? Will we need to refashion those expectations and criteria for the new writing? The resources in this collection suggest that yes, we need to revise both. While the crib sheet focuses only on multimedia products, the materials from Kevin Hodgson and Paul Allison remind us of an “old” principle of teaching that carries over to digital composing: focus on process as well as product. Both add new expectations and criteria to old. Both use student self-assessments that include performance expectations for creating a text. Hodgson also uses a rubric for evaluating a finished text; for Allison, the completed self-assessment guides his final assessment. In short: they show options for grappling with the move into multimedia projects. Where will we go from here in the assessment of multimedia projects? We predict that the process will continue to evolve. Whatever learning expectations and criteria may emerge, we foresee that they will derive from the disciplines of rhetoric, cognitive psychology, and aesthetics: rhetoric because we are still dealing with human-to-human communication; cognitive psychology because we will be learning about the ways in which the mind processes these new, often multimodal compositions; and aesthetics because we respond to what our cultures judge to be beautiful.